Welcome to the Limestone West Proposed Timber Sale Project Webpage! The Montana Department of Natural Resources and Conservation (DNRC) Trust Land Management Division (TLMD), Bozeman Unit, is currently evaluating State trust lands within the Limestone/Nichols Creek Area near Bozeman, Montana for potential timber harvest activities in an area encompassing up to 2,725 acres within sections 3, 4, 9, and 10 T3S R6E and section 34 T2S R6E. Currently sizeable areas of the lodgepole pine trees within the proposed harvest area have experienced serious infestations of mountain pine beetle in the past years resulting in significant rates of mortality in the mature age classes. The Douglas-fir stands within the area are confronted with health and vigor issues due to the overstocked conditions and would benefit from selective harvesting practices. We recognize that this is an important area to our neighbors and many community members throughout Bozeman and its surroundings. We want to provide you with every opportunity to ask us questions about the proposed project, provide input, share your concerns, and stay updated on and involved in each step of the process. We will be updating this webpage throughout the development of the proposed timber sale. How can I be involved and stay informed? Throughout summer 2016, DNRC specialists gathered data in the Limestone West project area. DNRC sent out two scoping notices to interested parties for the proposed Limestone West Timber Sale. Since March 1st, DNRC has received approximately 300 comments from interested individuals. The ID Team will use issue statements and other comments to develop a selectable range of project alternatives and to design the effects analysis for the Draft EIS, as well as potential mitigation measures. The public will also have the opportunity to submit comments during the review period of the Draft EIS. Upon ratification of the Montana State Constitution in 1889, the U.S. Congress granted certain lands to the State of Montana for support of common schools and other public institutions. To this day, these lands are held in trust for the specific trust beneficiaries to which they were assigned and ultimately for the people of the State of Montana (1972 Montana Constitution Article X, Section 11). 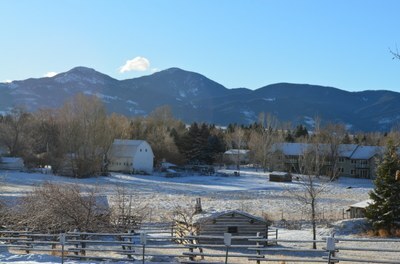 The Board of Land Commissioners (Land Board) and the DNRC TLMD are required by law to manage these State trust lands to produce reasonable and legitimate return for the trust beneficiary institutions while considering environmental factors and protecting the future income-generating capacity of the land (1972 Montana Constitution, Article X, Section 11; Montana Code Annotated [MCA] 77-1-202). State trust lands within the Limestone West area are currently held in trust for the benefit of Public Buildings and Montana Tech. Why is DNRC proposing to harvest timber in the Limestone/Nichols Creek Area? Part of DNRC’s mission is to manage the State forest resource for its health and long term sustainability and to protect and enhance the future income-generating capacity of the trust land. What are the proposed project objectives? Manage the forest resource to promote improved health, productivity, and diversity. Capture the value of dead, dying, and decadent lodgepole pine. Generate revenue for the trust beneficiaries. Minimize fire and safety risks imposed by these conditions. Enhance and expand the existing transportation system to provide improved access for long-term future management of the area and fire suppression needs. Where specifically would activities take place? DNRC TLMD is conducting analysis for harvest activities in an area encompassing up to 2,725 acres within sections 3, 4, 9, and 10 of Township 3 South, Range 6 East and section 34 Township 2 South and Range 6 East. See Map of Project Area. What is the State Forest Land Management Plan? The State Forest Land Management Plan (SFLMP) is the plan under which DNRC manages forested state trust lands. DNRC developed the SFLMP in 1996 to provide field personnel with consistent policy and direction for the management of forested state trust lands. The SFLMP provides the philosophical basis, technical rationale, and direction for DNRC’s forest management program. The SFLMP is premised on the philosophy that the best way to produce long-term income for the trust is to manage intensively for healthy and biologically diverse forests. In the foreseeable future, timber management will continue to be the primary source of revenue and primary tool for achieving biodiversity objectives on forested state trust lands. What are the Forest Management Rules? The DNRC Forest Management Rules (ARM 36.11.401 through 456) are the specific legal resource management standards and measures under which DNRC implements the SFLMP and subsequently its forest management program. The Rules were adopted in March 2003 and provide the legal framework for DNRC project-level decisions and provide field personnel with consistent policy and direction for managing forested state trust lands. All forest management projects administered by DNRC on forested state trust lands must comply with the Forest Management Rules. What is the annual sustainable yield? The annual sustainable yield (ASY) refers to one of DNRC’s fundamental management tools for conducting activities on forested state trust land. The ASY is defined by statute as: "….the quantity of timber that can be harvested from forested state lands each year in accordance with all applicable state and federal laws, including but not limited to the laws pertaining to wildlife, recreation and maintenance of watersheds, and in compliance with water quality standards that protect fisheries and aquatic life and that are adopted under the provisions of Title 75, chapter 5, taking into account the ability of state forests to generate replacement tree growth" (77-5-221, MCA). DNRC is required by statute (77-5-221 – 223, MCA) to recalculate the ASY of forested state trust lands at least every 10 years. Recalculating this often helps DNRC account for updated inventory data and volume lost to large scale fires, insect and disease outbreaks, and other factors. The ASY calculation determines the amount of timber that can be harvested annually on a sustainable basis from state trust lands. Important ecological commitments from the SFLMP and Rules related to biodiversity, forest health, threatened and endangered species, riparian buffers, old growth, and desired species mix and covertypes are incorporated into the ASY calculation. In 2015, the state-wide ASY was calculated to be 56.9 MMbf of timber. What is the Montana Environmental Policy Act (MEPA)? State agencies must make a deliberate effort to consider the effects of their actions on the natural and social environment prior to making a decision. The decisionmaker and the public should be well informed of the environmental impacts of the decision before the decision is made. State agencies must ensure that the public is properly informed and offered opportunities to participate in the decision making process. In order to fully understand the potential issues associated with and effects resulting from state actions, agencies are directed to obtain the input of others. This is important because state government often makes decisions that can impact the environment or affect personal property rights or quality of life, and no one decisionmaker has all the answers. For more MEPA information see Citizen’s Guide to Public Participation in Environmental Decisionmaking.